Hackweek VI will take place January 24th – 28th, 2011. Hackweek is one of Novell’s biggest ways of giving back to the openSUSE community – by providing developers the opportunity to spend their paid work week contributing to free and open source software instead of their assigned projects. Â Hackweek V produced an amazing variety of projects, including froxlor (server management panel), a donor management app for Shelterbox, a GUI client for SUSE Studio, and hundreds more. Prior Hackweeks have spawned projects that are now desktop Linux mainstays, like Tasque and Giver. Hackweek VI features the theme “Engineering Cloud” and allows developers to get their hands on related projects. In order to support that approach, we are providing access to a few select cloud providers and a setup where you can deploy cloud infrastructure software (e.g. Eucalyptus). Your favorite hack-project may or may not relate to that theme, it may well be experimental, as long as it is Linux- or SUSE-related. As in previous years, we will be using openFATE to track your ideas and coordinate with others that might want to join a project. 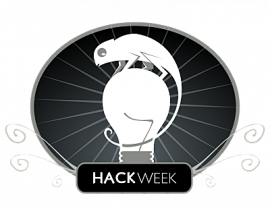 Make sure to check out all ideas listed in the Hack Week VI product category. As usual, Novell extends the invitation to openSUSE Community contributors. Â Participating Novell locations also try to provide a “hackspace”, some comfy place to meet, work together and snack. Finally, we are trying to spread the word via #hackweek6 on twitter and look forward to hear about your updates there. Â For more information, follow up on the Hackweek Portal atÂ http://en.opensuse.org/Portal:Hackweek, and have fun!